Increase your already powerful E90, E92, or E93 M3 by adding the Active Autowerke Performance Software. 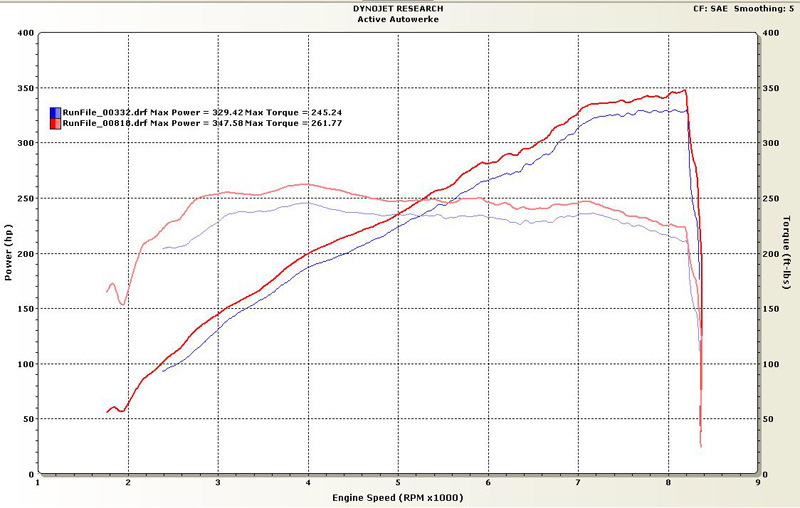 Improve the overall performance of your E9X M3 with the Active Autowerke Perfromance Software. Through careful remapping of your vehicles onboard computer, various elements such as ignition timing, and fuel delivery are reworked to create performance gains. The Active Autowerke Software delivers gains of over 15 horsepower, while still maintaining factory driving characteristics. Custom configurations are available when pairing with the Active Autowerke Signature Exhaust system, Signature Pulley or other performance upgrades. Important: Once purchased through the website please print and fill out the sheet located in the URL below. PLEASE include a completed copy with your M3's DME. Air to fuel ratio still within factory specs. It is the customer's responsibility to ship your M3's DME to Active Autowerke, the address to ship to is located at the bottom of the URL noted above. Once Active Autowerke receives your M3's DME, it will ship out the same day. The DME will be shipped via 2 day air back to you, with the option of next day air shipping at an additional charge of $25. Please click the link below to open the guide to help you remove your DME.